For over 15 years I ran a handmade card business with over 2,000 accounts and dozens of sales reps.
People often ask me how to make a living selling handmade cards. There is a big difference between making cards to sell in a craft market, and creating a handmade card manufacturing business. There is also a big difference between a commercially printed card business and a handmade card business. Craft cards are usually one-of-a-kind that can't always be repeated, and printed cards don't require as many supplies and hand skills as handmade. Many designers have very different experiences in beginning a business, and here are some suggestions, of steps I took when starting out. Develop a line of 25-50 cards. Make sure you are following industry standards such as: parts of a greeting card, backcopy, card codes, envelopes. Also consider 3 basic card design tips on 3 things to avoid in a card design. Order swatch books, envelope, paper and bag samples from suppliers. Take cards around to local stores to get feedback. Don't try to sell them, just ask for professional advice. Learn how to present your card line to reps or consultants. Experiment with different designs and styles and get feedback from the Greeting Card Designer Facebook Group or professional consultants. Try to get feedback from at least 5 people or stores. Don't rely on feedback from just friends, relatives, classmates, or anyone who doesn't work in the industry. Communicate clearly that you want brutal honest feedback, and that you won't get your feelings hurt if they don't like them. Be ready to accept rejection and learn how to deal with rejection. If they don't like the cards, make sure you never leave that meeting without taking notes on how you can improve the line and recommendations on what direction you might pursue. 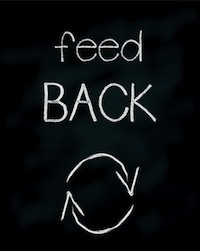 Readjust your designs according to your feedback. If line needs to be completely redone, start at phase 1 again. If only minor adjustments are needed, perfect them. Expand designs you do well with, and drop cards that received negative responses. Understand why you must manufacture on a large scale, so you can grow. Learn about handmade card production and how to make a handmade card factory. Think about how to simply your manufacturing. Understand your pricing and profits and what to avoid buying for your business. Make sure your cards are profitable. If they aren't profitable, make adjustments. Calculate your costs and see if your designs are cost effective. Keep receipts for all your supplies. Research suppliers and find several suppliers that carry the materials you need. Compare prices and find the most reasonable one. All of the following activities may be done earlier in the business development process, but about this time is when you need to start thinking of these things. Get a PO Box. Unless your home address is very stable, get a Post Office Box. This will help keep your business separate from your personal life. Get licenses. A business license is obtained in the city where the business is located The zoning license is usually obtained with your business license, in the city where the business is located. Do you want a fictitious name? If you create a name for your business, you need to get it approved with the county clerk. 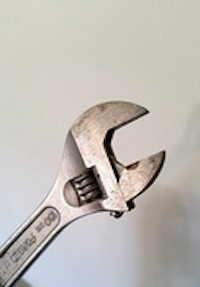 Get a resale license so you don't have to pay sales tax on manufacturing supplies. A resale license is obtained at the State Board of Equalization. Get a bank account. Open a checking account for your business, separate from your personal account. Set up credit accounts with suppliers. Submit your resale number with suppliers you think you will be ordering from. Apply for a credit line. Research Stores. Start searching for the types of stores that you feel your cards will do well in. Collect their names and addresses on index cards or a database. Create a one page business plan. Make an outline of how much money you plan to spend and how much income you hope to make for the first 6 months. Talk to a lawyer. Find a lawyer that will answer basic questions about copyrights, and protecting your designs. Design a logo and create stationery letterhead. Include your business name, your mailing and shipping addresses, a telephone number and a one line slogan of your card line. An example of a description might be: "Greeting cards for a New Age" or "Handmade cards with a touch of humor". Design a simple brochure that can be put into a loose leaf binder. Create an inexpensive brochure with all your card designs. Include a price sheet and ordering information. Decide what stores you will approach first. Clarify specifically what stores you will approach and be prepared to sell. Make sample deck. Prepare your sample deck with codes and prices per dozen/half dozen on the back. Print or buy invoices, mailing labels. Order invoices and mailing labels with your business name, address and phone number on them. Set up your books. Keep track of your supplier names and addresses, expenses, income, what cards sold per month, and any other information you need to refer to. Create a bill. Design a simple form for billing labelled "Overdue Notice". You will have to remind stores when their 30 days are up, in case they forget to pay on time. Make sure you have all your manufacturing supplies for at least sales of at least 2,000 cards. 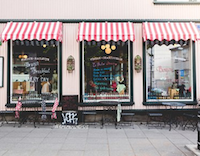 Familiarize yourself with local sales trends and what kinds of card people buy. Sell cards to at least 5-10 stores in your community and learn the lifecycle of a card sale. You will also learn what your top sellers are, which will help you plan your card line for the future. Get shipping boxes. If you are on a shoestring budget, find stores that throw out small boxes (make sure they have not had food in them) and start collecting them. Otherwise find a local supplier. You can order free priority tape, mailing labels and boxes from the post office, and they will also pick up your packages for free at your doorstep when you register online. Once your business picks up, you may want to investigate other shippers such as UPS and FEDEX. Go around to local stores and try to sell your cards. Set a goal to get at least 10 accounts. Collect rep contacts. Before actually contacting reps, start collecting their names and territories, so you can contact them later. Make sure you are ready for a rep. Contact reps. Once you have determined that stores are buying and reordering your cards, you may be ready to contact reps. 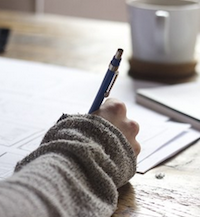 Learn how to work with a rep and set up rep paperwork. Set aside a file folder for each rep. Keep records of your correspondence, commissions paid, commissions due, pre-printed labels of their mailing address (you use these a lot!). 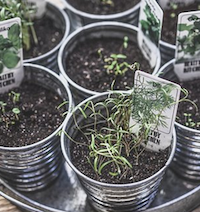 Make sure you are ready to grow and that your suppliers are dependable. Are you able to order larger quantities? Do you need to readjust your line of credit? Can you manufacturer two, three or four times as many cards? Stock up on emergency supplies that are hard to find. Evaluate workspace. Set up your workspace for assembly line work. Determine where you will store large amounts of supplies and how you will organize and label different boxes of cards. Investigate or invest in computerized record keeping. Evaluate record keeping programs such as Quickbooks. Look for programs that track inventory and commissions. Take a class at a local adult school and see which program you like. Design new cards every three months. Get into the pace of putting new cards out in the market about every three or four months. Promote your line through industry publications and websites and learn the mistakes artists make when they send press releases. See errors or bad links? email Greeting Card Designer Blog. 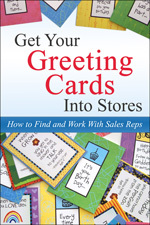 Get Your Greeting Cards Into Stores: How to Find and Work With Sales Reps (Updated 2017 paperback) If you like to make greeting cards, this book explains how to get your cards into stores and sell them nationwide. Learn about changing trends in the indie card market and niche opportunities available for artists. Book includes detailed guidelines on pricing cards for a profit, getting professional feedback on your designs, finding sales representatives, pitching your card line to them, approaching stores, and the industry standards you should follow. Information is also applicable to gift items, such as magnets, journals and calendars. Start and Run a Greeting Card Business From a British author, whose country has a long history of greeting card design, she takes you step-by-step through the process of starting and running your business with lots of useful practical advice to help you, including: - Deciding what type of cards to produce - Finding your market - Dealing with printers - Copyright and licensing - Pricing and profit. Kate's note: Some specs are different (card sizes) since it is UK standards. Pushing the Envelope Things the small greeting card manufacturer needs to know about finding, recruiting and retaining a winning sales force can be found in this easy-to-read handbook. Written from both the manufacturer and sales rep perspectives, this nuts and bolts guide is full of industry information, sales tips and guidance for building successful and profitable rep relationships. Kate's Note: This book was written by my top selling sales rep in the country. Hello from Kate Harper. 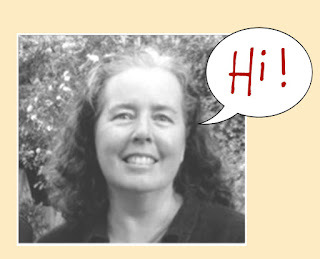 I am a designer who lives in Berkeley California and have worked in the greeting card and gift industry for over 20 years. Greeting Card Design This volume features a vast array of fun, elegant, simple and imaginative greeting cards designed by internationally-known artists, illustrators and calligraphers. With over 300 full-color photographs of creative, popular, and inspiring greeting card designs, this invaluable sourcebook showcases the very best of what is happening in the industry today. Accompanying text explores the history of the greeting card industry and examines the major contributions from the leading innovative companies. Greeting Card Design and Illustration 12 step-by-step demonstrations show how to create successful greeting cards Samples of 130 actual greeting cards Twelve step-by-step demonstrations by professional greeting card artists show you how to combine basic illustration techniques with the eight most popular mediums. This art technique book is a comprehensive and practical guide to all aspects of designing and creating professional greeting cards.Samples of 130 actual greeting cards.leads you through every stage of the design process. By the Batch Innovative new ideas for creating fabulous cards (and envelopes, tags, and bookmarks) in batches, with impressive results. The wide range of techniques presented includes everything from the tried and true (rubber stamping) to the unexpected (polymer clay), from the spontaneous (smudge-and-smear) to the whimsical (shaped cards). And author Judi Kauffman shows precisely how to put pedal to the metal and create whole batches of cards in just one sitting. Kate's Note: See my book review here with photos and information. Mary Engelbreit: The Art and the Artist This book is about her path into art licensing and greeting card design. She is now a successful licensor, her career spans over decades, and she was awarded "best art license of the year" by LIMA. Kate’s Note: See my book review on "7 things I learned from Mary". This book is one of the more encouraging and practical books I've read in awhile. She confirmed my inherent belief that if someone tries to impose rules and prerequisites on entering this career, someone else will come along, break all the rules, and become successful. The Very Best from Hallmark: Greeting Cards Through the Years. This collection of 750 of Hallmark's best takes readers through seven decades of birthdays, births, trips, holidays, get well wishes, graduations, and more. The story of this remarkable company is as fascinating as the cards. License to Draw is a fresh new perspective on monetizing your creative pursuits, reflecting changes in the market and more ways to make money with your art. Successful artist and writer Ronnie Walter has has written a detailed handbook that includes how to figure out what kind of artist you are, how to develop the right presentation for the right clients and an in-depth look at the essentials of a good contract. Written in a friendly and readable style, you'll find inspiration, motivation and a step by step explanation of how to dive into art licensing. 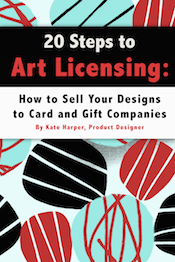 20 Steps to Art Licensing: How to Sell Your Designs to Card and Gift Companies A booklet on how to license your art to companies that publish greeting cards, and manufacture coffee mugs, magnets, wall hangings, kitchen items, and dozens of other gift items. This booklet covers 20 basic steps from how to prepare your art, to what companies to contact. It includes topics on: How to find agents, classes and what trade shows to attend. There are extensive resources on social media, licensing community groups, copyrights, and lists of interviews with professional designers. Licensing Art 101, Publishing and Licensing Your Artwork for ProfitThis comprehensive handbook guides readers step-by-step through the licensing and publishing industry. It contains a wealth of ideas and practical examples of how to increase income through licensing reproduction rights to manufacturers and publishers of greeting cards, posters, calendars, and more. This book provides assistance from an expert, allowing readers to educate themselves and gain a competitive edge. Readers learn about: negotiating fees, exhibiting in trade shows, protecting their rights, and more. Over three hundred professional contacts are listed. Licensing Art and Design: A Professional's Guide to Licensing and Royalty Agreements This text shows the designer, illustrator, photographer or fine artist how to increase income by licensing creative images. Coverage includes: copyright, patent and trademark law; licensing agreements; maximizing royalties; negotiation checklists; model agreements; finding manufacturers; and licensing in cyberspace. 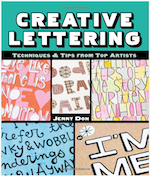 You Can Write Greeting Cards This hands-on guide features practical instruction and exercises that teach beginners how to survey the market, find their niche, and write greetings cards that say just the right thing. Kate's Note: See my interview with the author here. 7 Mistakes Greeting Card Writers Make Booklet on common mistakes greeting card writers make and what to avoid when submitting greeting card verse to publishers. Today, greeting card publishers are shying away from traditional stereotypes, and may even include pets as family members. This article talks about how to create a trendy card that reflects the contemporary world we live in, and how to use our own personal experiences to create great card verse. Topics include: how to avoid limiting the market of who could buy your card, when to use adjectives, how not to creating card for enemies, how to write like people talk and a list of why card sentiment submissions are often rejected. The good news is you can increase your odds of success by 60% by doing a few simple things. BONUS: Includes a list of card publishers and their guidelines, links to writer interviews, and exercises for creating good verse. The Freelance Writing for Greeting Card Companies This book targets important areas a writer needs to know in regards to being self-employed, as well as, how to own a small greeting card business. It covers Internet to explore the technology which has opened the door for freelance writers and artists. You will find web sites that will offer a variety of freelance writers opportunities never before known or unreachable outside the Internet world such as: chat rooms, bulletin boards, or forums so writers can communicate with other writers. This type of networking is ideal for finding answers or obtaining valuable information about a company, organizations, writing groups, and available resources. How to Write and Sell Greeting Cards, Bumper Stickers, T-Shirts and Other Fun Stuff A successful freelancer shares her years of experience and advice in writing for the "social expression market". Finding the Right Words: Perfect Phrases to Personalize Your Greeting Cards More than three dozen ways to say "Happy Birthday” for new family members...even pets. Includes thoughtful condolences for personalizing sympathy cards and congratulatory wishes for weddings and anniversaries. There are helpful hints to simplify card-sending and a monthly calendar for birthdays and anniversaries. This is a book of phrases for all occasions. 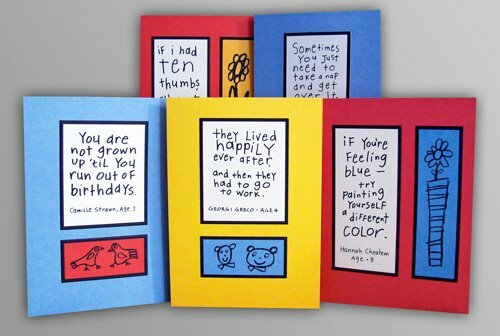 Thinking of You: A Card Greeting for Every Occasion This little books helps to jump start your thinking to make messages for cards. 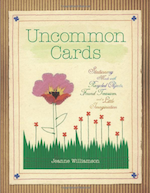 A Guide to Greeting Card Writing All forms are discussed in detail: conventional verse and prose, personal relationship cards, humor, juvenile, inspirational, etc. 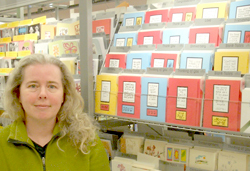 Detailed info on how to submit and sell your work to greeting card markets. All the nuts and bolts of both the creative art and the publishing market. Handmade Greetings This book is a showcase of 1000 contemporary hand-designed greeting cards, with examples that feature a wide array of paper craft techniques, including: paper cutting, paper stencils, stamping, punching, stitchery, monoprints, screenprints, paper piecing, and more. Kate's note: See images and my review of this book here. The Complete Photo Guide to Cardmaking This book includes step-by-step photographed instructions for a wide range of techniques, as well as projects to accompany each area of card making. All paper-crafting techniques that can be employed for card making are thoroughly covered, including a comprehensive description of paper types available, folding options and techniques, coloring and image transfer methods, and adding embellishments. Inside, you'll also find methods for using a computer to design and print cards. More than 80 projects give you lots of ideas and inspiration to create cards of your own, using the techniques you've learned. Unique envelope templates and a helpful source list are included. The Encyclopedia of Greeting Card Tools and Techniques Featuring hundreds of handmade cards from leading artists, plus step-by-step photographs of key skills.Sidebars on today's most creative card makers showcase their areas of expertise, from Dee Gruenig's rubber-stamp designs to Alli Bartkowski's quilling. Start with a Scan A guide on how to transform raw, scanned images into attractive, finished illustrations. Filled with hundreds of illustrations, it starts by covering the technical basics of scanning, and provides the information needed to get images out of the computer and onto the printed page. The rest of the book shows how to scan almost anything (burlap, clip art, family photographs, found objects) to create a quality piece of artwork. Learn how to create textures and backgrounds, transform photos into graphics, and work with type. Two chapters discuss scanning images for the Web and using scanned images in arts and crafts projects. Book is a resource for scanner users who want to focus on illustrative techniques rather than technical issues. Creative Lettering: Techniques and Tips from Top Artists Sixteen calligraphers, painters, collagists, card makers, fiber artists, and graphic designers—give their personal perspectives on lettering. They all offer their favorite tools, how they use them, their signature technique with step-by-step instructions and photos, and an alphabet sampler of their own font. Uncommon Cards: Stationery Made with Found Treasures, Recycled Objects, and a Little Imagination This DIY guide contains eight sheets of cardstock and basic stitch patterns that can be completed with nothing more than a needle and thread, either by hand or machine, transforming a blank card into a whimsical, inspired, one-of-a-kind design. The perfect expression for birthdays, graduations, or a simple thinking- of-you note, each design incorporates inexpensive and easy to find household items such as strips of fabric, brightly colored plastics, handmade stamps, and more. 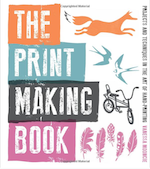 The Print Making Book: Projects and Techniques in the Art of Hand-Printing Techniques include relief-, screen- and mono- printing – all using tools and materials that are easy to source and use at home in your kitchen, bathroom, or garden. There are easy-to-use templates, step-by-step illustrations, and full-color photography throughout. 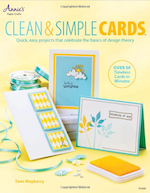 Clean and Simple Cards: Celebrate the Basics of Design Theory More than 45 card designs are provided, with full instructions and close-ups that display card details, and the book includes source lists for recommended supplies to replicate the designs at home. The uncomplicated projects make the book suitable for beginners, and more advanced crafters will appreciate the outline of design theory that enriches their existing card-making experience. The basic tools and techniques of card creation are also covered, from stamping to hand-coloring. Unusual Ways to Market Your Greeting Cards and 22 Places to Get Your Designs Featured A booklet on how to get your cards noticed in non-traditional ways. Everything from why you should send cards to your dentist, to how to get special features in national publications. Great tips for designers who are starting out and want to get their cards into the hands of people beyond friends and family. Special Section: Submissions guidelines and contacts for 22 Gift Industry publications and professional gift industry blogs that seek out new greeting card designs to feature for free. Selling Art Online The Creative Guide to Turning Your Artistic Work into Cash Selling Art Online shows you several ways you can take your art, and be a creative entrepreneur. For an illustrator, artist, designer, photographer or any variety of visual creator. It gives you tools to do more with the work you have, providing you new opportunity for more revenue and exposure. Straight Advice: How to Market Art Online Now Barney Davey has 30 years of experience helping artists get their work to market. Topics include: How to Market Art Online, Marketing Art Online, Understanding The Value of a, Customer Persona, Websites for Artists, E-Commerce, Domain, Names, Email Marketing for Artists, Marketing Automation, Blogging and Social Media. The Essential Guide to Business for Artists and Designers This book is for artists, makers, designers, and photographers looking to set up and establish an arts practice or design business.Topics include: Building networks and successful negotiation tactics, Promoting an engaging social media presence, Business planning and money management, Overview of legal, tax and intellectual property issues, Setting up a website and trading online, Exploiting innovation and future trends. Burn Your Portfolio: Stuff they don't teach you in design school, but should. Michael Janda, owner of the Utah-based design firm Riser, uses humor to dispense nugget after nugget of hard-won advice collected over the last decade from the personal successes and failures he has faced running his own agency. In this surprisingly funny, but incredibly practical advice guide, Janda's advice on teamwork and collaboration, relationship building, managing clients, bidding work, production processes, and more will resonate with creative professionals of all stripes. Artist's Graphic Designer's Market For people who want to expand a career in fine art, illustration, or design. The Artist's & Graphic Designer's Market a reference guide to help develop their careers and navigate the changing business landscape. It introduces a whole host of new features and guarantees the most up-to-date, individually verified market contacts possible. Etsy Excellence: The Simple Guide to Creating a Thriving Etsy Business In this book, top Etsy sellers share the tools that have helped them, the changes they made o get better results, and their advice for achieving and sustaining a successful Etsy shop. Topics include: Photograph your products for maximum appeal, Create a unique Etsy shop that stands out, Write winning product descriptions, Price your goods appropriately, Market your products effectively on social media platforms, Maintain lasting relationships with your Etsy customers, Diversify your Etsy product offerings. The Copyright Zone: A Legal Guide For Photographers and Artists In The Digital Age If you license or publish images, this guide is as indispensable as your camera. It provides specific information on the legal rights of photographers, illustrators, artists, covering intellectual property, copyright, and business concerns in an easy-to-read, accessible manner. The Copyright Zone, Second Edition covers: what is and isn’t copyrightable, copyright registration, fair use, model releases, contracts and invoices, pricing and negotiation, and much more. Legal Guide for the Visual Artist This book provides legal guidance for any visual artist involved with creative work. Topics covered: developments in copyright, artists in artist-gallery relationships, First Amendment protections for graffiti art and the sale of art in public spaces, cases dealing with art and privacy, model contract for Web site design. The book also covers copyrights, moral rights, contracts, licensing, sales, special risks and protections for art and artists, book publishing, video and multimedia works, leases, taxation, estate planning, museums, collecting, grants, and how to find the best professional advisers and attorneys. In addition, the book teaches strategies for negotiation, gives information to help with further action, contains many sample legal forms and contracts, and shows how to locate artists' groups and Volunteer Lawyers for the Arts organizations. Get Your Greeting Cards Into Stores: How to Find and Work With Sales Reps (Updated 2017) If you like to make greeting cards, this book explains how to get your cards into stores and sell them nationwide. Learn about changing trends in the indie card market and niche opportunities available for artists. Book includes detailed guidelines on pricing cards for a profit, getting professional feedback on your designs, finding sales representatives, pitching your card line to them, approaching stores, and the industry standards you should follow. Information is also applicable to gift items, such as magnets, journals and calendars. Should you license or self-publish your designs?